Headed to the gym at 10:30, swam my 35 laps (~half mile) in about 40-45 minutes. After that, I was in a group class for some conditioning with one of the trainers. Wow, that class kicked my tush! I always thought my legs were strong, which they are to a point until I try doing fast, coordinated moves that I’ve never thought of doing before, and then my body turns into this weak-feeling, uncoordinated bag of lead. Hahahah! Learning curves are so brutal! It was so beautiful out for most of the day. It was hard to decide whether to cram in the first bike ride of the season into the day, but it was supposed to start raining early afternoon. My bike was due for proper tune-up and maintenance so it was in the shop and I had to pick it up. It had a broken spoke, back brakes that needed adjustments, and apparently, I needed a new chain. And they cleaned everything. Haven’t really done it since I bought the bike in 2012. So, I can’t complain. I ended up returning the backpack I got last time. It was a great backpack, but I felt like I needed a bit more space. It filled up so quickly. Partly because the sleeping bag wasn’t as compressed as it could have been with a more compressive stuff-sack. Note to self: practice packing extremely light. 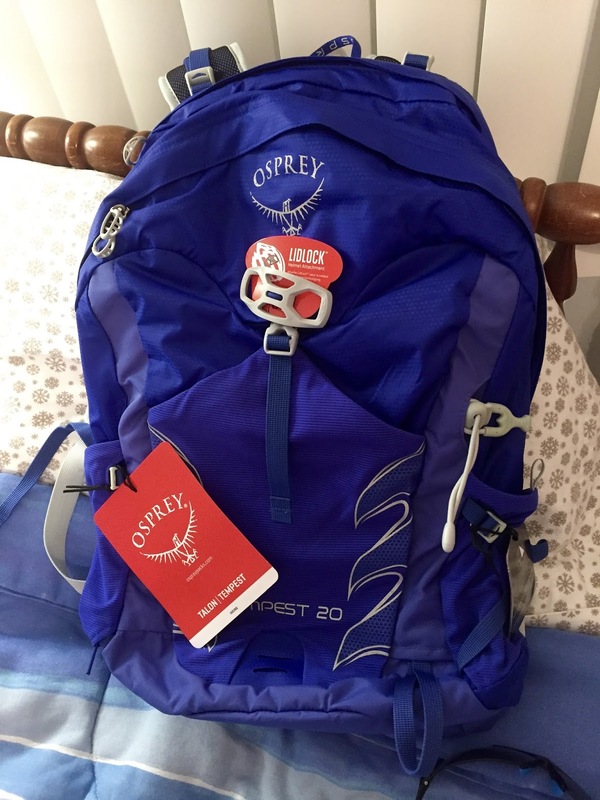 I bought two backpacks, a smaller day pack, and a rainforest green Osprey Aura (with Anti-gravity back mesh) 65L pack. So, together, 85L, that will just have to be enough. I’m going to have to learn how to pack the bare minimum essentials. The store didn’t have the Aura 65L pack in the store so I tried on the tan one, such a boring color so I ordered the rainforest green. 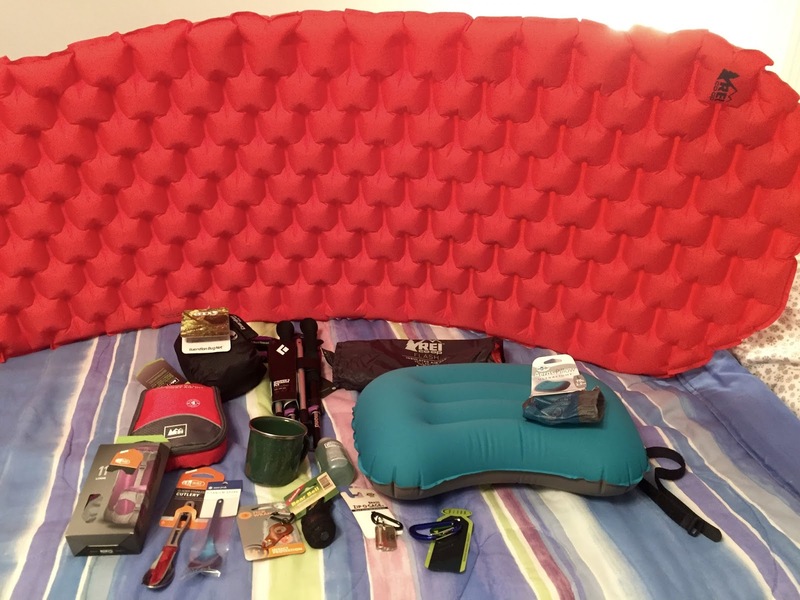 It should get to the REI store this week and I’ll go pick it up in time for my camping essentials class next Sunday. I got my REI World MasterCard this week. Super pumped about that. I was able to use the gift card my Dad gave me for my birthday on my stuff today which helped with the total….ouchy. But I keep reminding myself, this is an investment just like my road bike; it’s a big one-time expense, and then you’re set for YEARS of fun and adventure. So, it’s an investment; I’ve saved for this investment, and it will be worth it! 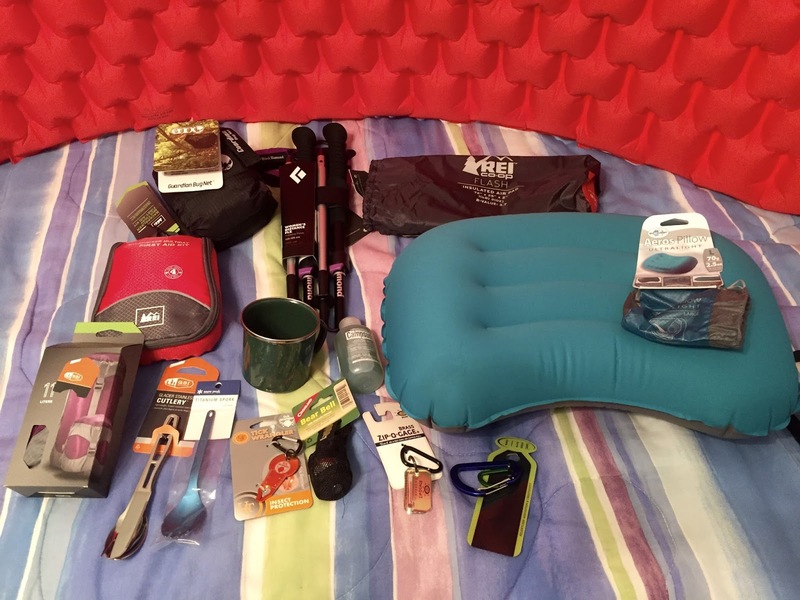 Pillow, silverware, bear bell (for Ragnar), carabiners, tick remover, first aid kit, compression stuff-sack, cup, trekking poles, mosquito net that surrounds my hammock, camp suds. Broader view of my sweet camping air mattress. 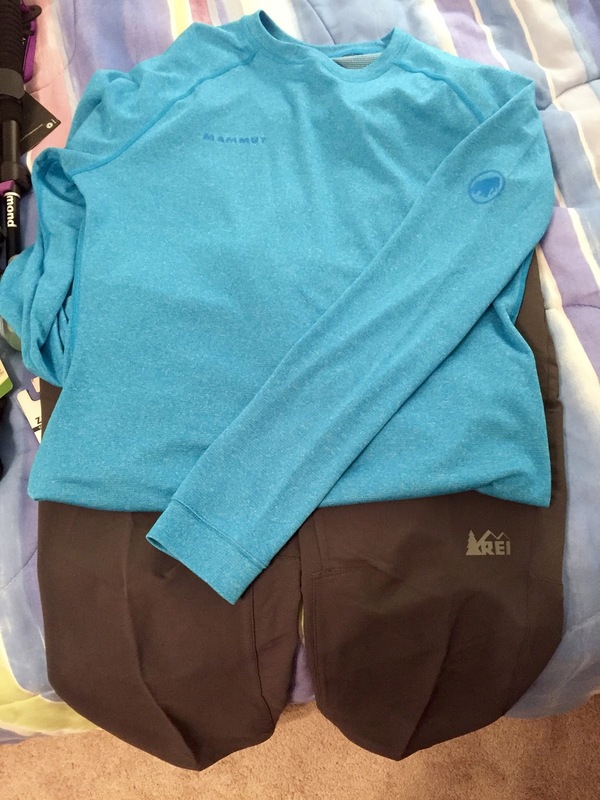 REI Activator Soft-Shell pants – super comfy; and Mammut base layer long-sleeve=cozy! That’s it for today. I didn’t really eat breakfast so I was starving by the time I got home from REI and I was in the mood for my favorite Thai food place in Upper Montclair. So I took myself out to dinner and loved it. Best pad thai ever! Last thing for the day… 23 weeks left as of yesterday. And after Glacier National Park, we’re going to Banff National Park. Training for the triathlon – I’m nervous that I’ve bitten off more than I can chew. I need to start biking ASAP as this really helps my running ability. Swimming is in ok condition. I’m reluctant to even look at a triathlon training schedule because if I’m super off track or super unprepared, I’m afraid I’ll chicken out. I did my first Ragnar essentially off of my miles and miles of biking and adrenaline. My Rugged Maniac obstacle course, also possible thanks to miles and miles of biking and the energy and adrenaline from the crowd and the friends I was with. But with this triathlon, it’s going to be just me against the hundreds of other contestants; no one I know will be going through this with me. A few friends may be there to cheer me on, but it will be just me. Ok, the one last things; I signed up for a Tough Mudder Half. I’ll be competing with my good friend and India study abroad roommate and her friend. I’m so excited for it. That’s at the end of July… Ragnar is end of April, Triathlon in late May, and Tough Mudder end of July… the last hurrah before saying goodbye to NYC and heading out for who knows how long. I can’t wait.